Bluehost is a web hosting company based in Orem, Utah and has been around since 2003. It was founded by Matt Heaton. The company has provided a variety of hosting services and features, such as WordPress hosting, shared, VPS and dedicated hosting, as well as cloud and reseller hosting. On top of this, they have a 24/7 customer support department which includes live chat, support tickets, phone-based assistance (domestic & international numbers) and an extensive searchable knowledge base. Bluehost has been hailed by many as one of the best hosting services out there. Since everyone’s needs and desires are different, this Bluehost reviews will help you decide on your own if Bluehost is right for you and your hosting requirements. Hosting plans and domain registration are the “meat” of anyone’s aims to have a corner of the web all their own, be it a blog, business, or both. Many web hosting service providers, therefore, aim to have at least some of the latest technology and hosting features that might help you to get your website off the ground and in the air. Shared hosting is the most common hosting plan you’ll see on just any web hosting service provider’s website. The features and price points will differ from site to site. 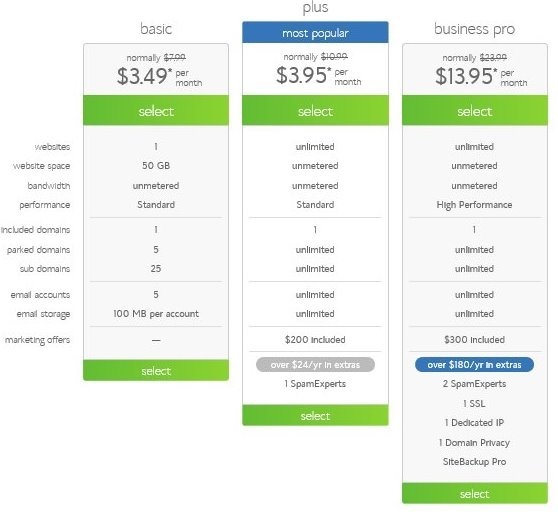 Bluehost’s shared hosting plan has three levels: basic, plus and business pro. The basic plan currently cost $3.49 per month (their current promotional price) is pretty decent when considering it’s their basic level. It includes one website, one domain, 50 GB of space to play with, 5 parked domains, 25 subdomains and five email accounts with 100 MB of storage per account. This level is for those who are just starting out, and it’s easy enough to upgrade to VPS or dedicated hosting within the cPanel if your site activity starts taking off. The server performance for both the basic and advanced levels of shared hosting are “standard”. 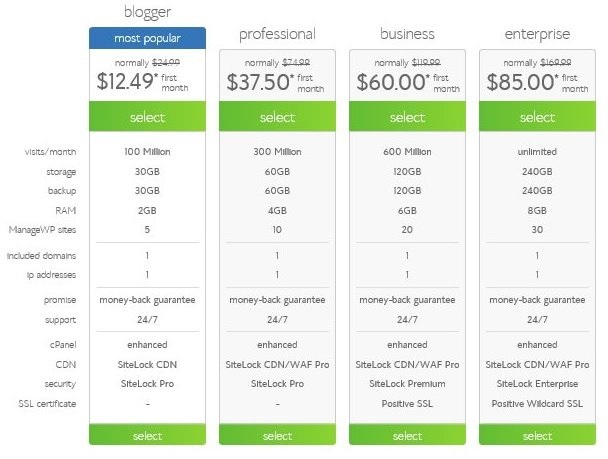 The “Plus” and “Business Pro” levels have a lot of features that rank as “unlimited,” such as how many domains you can have, how much space you have to grow your site, how many email accounts and how much storage is available for those accounts. The “Plus” level has $200 worth of marketing offers, and the “Business Pro” level has $300. If you want to dive directly into having a business site with e-commerce and so on, you’ll want to go with the Business Pro level. It will give you unlimited domains, space and email accounts. However, the pro level of shared hosting offers high server performance, 1 SSL, 1 dedicated IP address, domain privacy and Site Backup Pro. VPS hosting is one of the next levels up from shared hosting. VPS means “Virtual Private Server” and here’s a good analogy to help you understand what it means. Shared hosting is like sharing one house with your friends. VPS hosting, however, is like moving to an apartment building: instead of sharing one server with everyone else, a server is divided into different sections, so each person gets a private section of space, with varying speeds and space levels, depending on how much space you pay for. 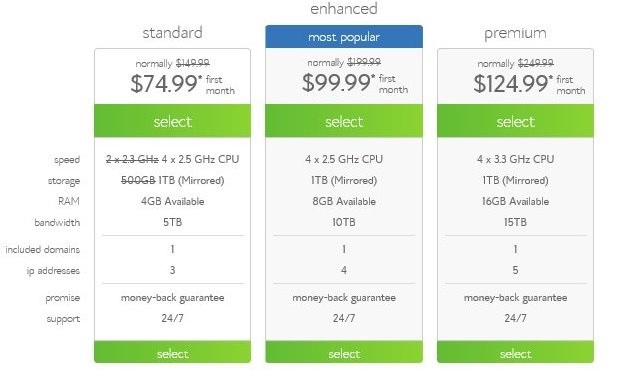 At Bluehost, the VPS hosting plan is divided up into four levels: Standard, Enhanced, Premium, and Ultimate. Enhanced is the most popular, as the price point is middle-of-the-road for the features you get, though you can go up to Premium and Ultimate if you need to. The features on those higher levels have 3 and 4 CPU cores and 3 and 4 TB of bandwidth respectively. Besides, there are nicely upgraded levels of RAM and storage space, with the Ultimate VPS plan topping out at 240 GB. Next level up is the Bluehost’s cloud hosting plan. Cloud server space is different from VPS in that there is a cluster of servers available for people, instead of a server being divided up into “virtual” servers. Cloud hosting, therefore, ensures that if one server goes down, it’s backed up by the other servers in the cluster, allowing you to keep your site going while the one server is rebooted or repaired. 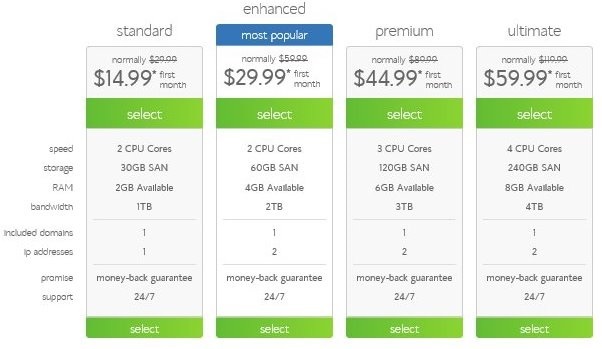 It’s often said that cloud services are more expensive than VPS, but Bluehost prices their cloud services quite similarly to their shared hosting plans. It has many same features, similar storage allotments, though cloud hosting allows for 100 GB of storage as opposed to the 50 GB allowed on the basic shared plan. If you’re on a traditional shared account, you can transition to cloud hosting with a bare minimum of fuss, which is great if you want the peace of mind that backup servers can bring. The dedicated hosting plan is essentially the most expensive options Bluehost has, but it offers you your own server. Bluehost support staff specifically to help you out with your dedicated hosting needs. If you are on the Business Pro level of either cloud or shared hosting and you know you’re going to need the space, dedicated hosting might just be the ticket. Some features of dedicated hosting include extreme speed, storage upgrades, root access for advanced users and RAID storage (Redundant Array of Independent Disks). This means your data is mirrored, therefore protected. It’s not the same as having multiple servers within a cloud, but not many web hosting providers have this available for their dedicated solutions. Bluehost seems to be somewhat unique on this, and it’s likely worth the money to have your own server. Also, when you request the dedicated hosting plan, the server is instantly provisioned, meaning it’s ready when you need it. Another hosting plan that’s becoming popular on the web hosting company such as Bluehost is the reseller hosting plan. What “reseller hosting” means is you set up your own hosting company, repackaging another hosting company’s products as your own, under your hosting label. Bluehost has operated their reseller hosting plan for some years now. They have kept on their current reseller customers. If you’re interested in building this kind of business, they’re redirecting people to another reseller hosting platform called ResellerClub, a hosting company they trust. Bluehost is not just providing web hosting service. You can also register your domains at Bluehost. This makes it more convenient to get your website up and going. Original top-level domain pricing for a dot-com, dot-net, dot-biz, etc. is $11.99, with the renewal price at $15.99. Not the most expensive, but not the cheapest either. Of course, if you want the fancier names, like “.blackfriday,” or “.boutique” or any other unique name, you’re going to pay more. Country code names (e.g. “.cc,” “.us”) are also on the pricey side, so you might want to do some shopping around before you make a decision. For overall hosting features, Bluehost is competitive in the hosting market. They have a decent list of e-commerce features, website scripts such as phpBB, Drupal, Joomla, WordPress and more. General features include email/webmail support (POP3, IMAP), cPanel, FTP access, resource protection, scalability, automated backup, and customizable error pages. Extra features such as unlimited domains and space are based on the level of hosting you pick, so just be aware of that. WordPress is one of the most popular sites and blog scripts out there, and there are some hosting companies that WordPress works well with and some that do not. 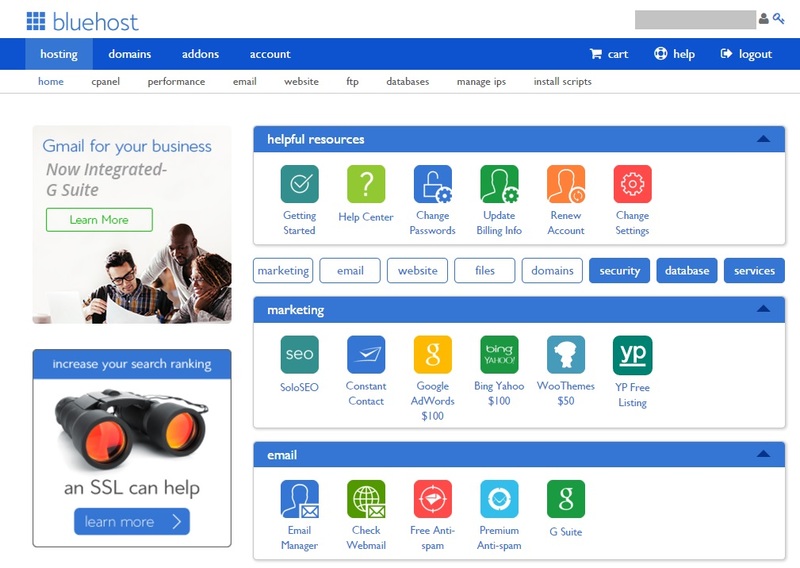 Bluehost is one of the former. In fact, Bluehost has a specific optimized hosting plan for WordPress. WordPress hosting is built on VPS technology, and Bluehost has support staff specially trained to assist you with your WordPress plan. The optimized plan has four levels, ranging from “Blogger,” which is the cheapest and most popular to “Enterprise,” the most expensive. The upper two levels have SSL technology included whereas the other two don’t. But if you’re using WordPress on the business side of things or selling goods, you’ll want that SSL encryption. The reason this optimized plan is good for WordPress users is that if you try to run WordPress on the shared hosting, even on the “Business Pro” level, the shared hosting is not that optimal on its own since you are sharing server space. That’s why Bluehost has particular VPS hosting for WordPress, optimizing that VPS space and anticipating tons of site views per month. If you’re gearing up to use WordPress in an e-commerce capacity specifically, check out WooCommerce, the most popular e-commerce plugin for WordPress. The WordPress + WooCommerce plan is the same price as the regular WordPress blogger-level plan, but you will also get an SSL certificate and a dedicated IP address for your customers’ safety. One of the genuinely good things about using WordPress on Bluehost is that Bluehost has been fully recommended by WordPress.org since 2005. Hence, using Bluehost’s optimized plan for WordPress is worth checking out. Email and webmail service on Bluehost is a regular hosting feature, with POP3 and IMAP email settings being required for setting up your webmail to receive and store emails. SMTP or Simple Mail Transfer Protocol is set up for outgoing mail only. There is a relatively wide variety of email services you can use from either mobile or desktop devices. You’re not limited to using Apple or Microsoft desktop email, though. There’s an option to receive the email from a Thunderbird account if you use Linux, so no worries there. For people who prefer webmail clients, Roundcube, Horde, and SquirrelMail are the three clients featured in the cPanel. If you have troubles understanding how to set these up, you can always check the knowledge base for step by step instructions. 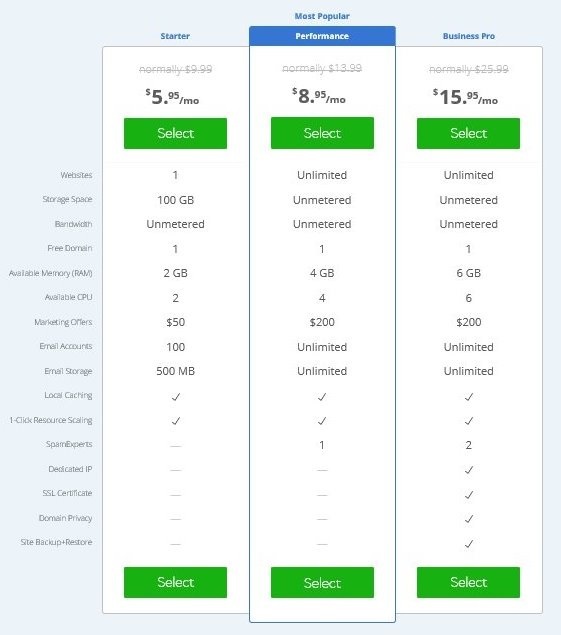 Bluehost allows you to create unlimited emails account on selected hosting plans. For example, unlimited email accounts on shared plus and prime package, but not the case on the cheapest basic shared hosting plan. Understand your email hosting requirements carefully before selecting your hosting plan. Bluehost provides 24/7 customer service in the following forms: telephone, support ticket, live chat and of course, the knowledge base. As far as multilingual support is concerned, while Bluehost does not outsource their customer service, the support is only given in English. When you consider that many other companies in the US provide bilingual support, for Bluehost to only provide support in English is something of a downside, especially since the US has many immigrants still speak their native language. There is a phone number for international customers, so there might be multilingual support on that line, but it’s difficult to say for sure. All that being said, Bluehost’s customer service staff are commonly reported to be helpful, knowledgeable and polite. I have shared my own experience with their Live Chat support, check my comment below regarding their support. Because their support system runs 24/7 and there is an international number available, you don’t have to worry about time zone differences if you’re doing business in another country. You could even be an American expat someplace and doing business with Bluehost, and you could still get your problems taken care of. If you’ve done some research on your own, you might read about some people having complaints about wait times on Bluehost. However, the wait times are not very long, with 30 minutes usually being the average maximum phone wait time reported. Of course, if you’re not a “phone person” to begin with, you can always use the live chat system to get an issue resolved. It’s often faster than the support ticket side since tickets may take a day or so to be noticed, depending on when you send the ticket. So, overall the support system is good, with very few legitimate complaints. 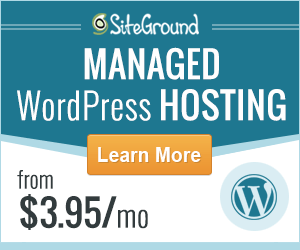 If you are looking for a web hosting service provider that having excellent support, we would recommend SiteGround. 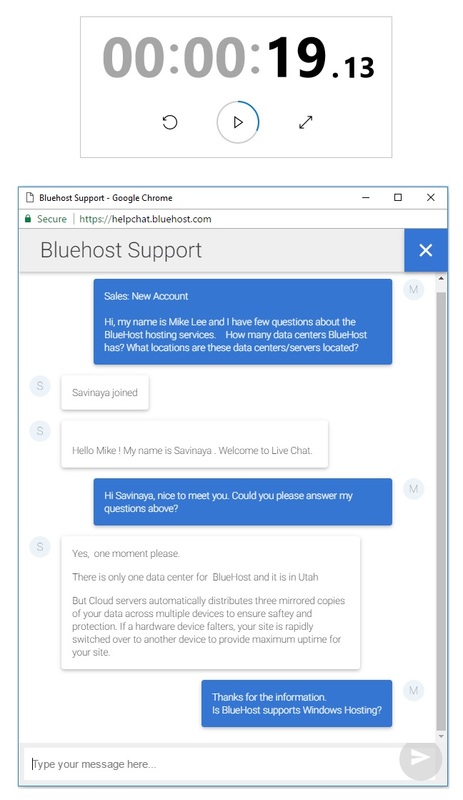 I contacted Bluehost Live Chat support to clarify few questions I had in mind. Overall I would say their support is quite good and professional. As mentioned, you may have heard someone complained about their support to be lousy, I would say this depend on individual experience. Bluehost is a web hosting company under the EIG network, just like another web hosting company HostGator which is also the under the same network, their support will not be always perfect but most of the time they will be able to help you in solving your problems. From my own experience with them, the live chat support was fast and I got their reply within 19.13 seconds. I chatted with Savinaya, a professional and knowledgeable support from Bluehost. Overall, I rated Savinaya 10 (Highest) for being so helpful and polite. Mike Lee: Hi, my name is Mike Lee and I have few questions about the BlueHost hosting services. How many data centers BlueHost has? What locations are these data centers/servers located? Savinaya: Hello Mike! My name is Savinaya. Welcome to Live Chat. Mike Lee: Hi Savinaya, nice to meet you. Could you please answer my questions above? Savinaya: Yes, one moment, please. There is only one data center for BlueHost and it is in Utah. But Cloud servers automatically distributes three mirrored copies of your data across multiple devices to ensure safety and protection. If a hardware device falters, your site is rapidly switched over to another device to provide maximum uptime for your site. Mike Lee: Thanks for the information. Is BlueHost supports Windows Hosting? Savinaya: No, we do not support Windows Hosting. Mike Lee: There is also another data center located at India for Bluehost.in, am I right? Savinaya: Yes, for Bluehost.in there will be the separate server. Mike Lee: How is the BlueHost WordPress hosting plan differ with the normal hosting plan? Mike Lee: I can see that Bluehost charges $149.99 for site migration service. Is there any Free site migration service as many hosts are doing it for free? Savinaya: No, there is no FREE migration service on Bluehost. Mike Lee: What is the type of certificate for the free SSL offered? Is it Let’s Encrypt? Savinaya: Yes, it is Let’s Encrypt. Mike Lee: What platform is the BlueHost using to support One-Click installation? Softaculous? Quickinstall? Savinaya: Let me check on it. Okay, it is Quickinstall. Mike Lee: Thanks. Will Bluehost back up my website automatically? Savinaya: We do offer complimentary backups for our customers. They are created on a daily, weekly and monthly basis. These backups are not guaranteed in any way. 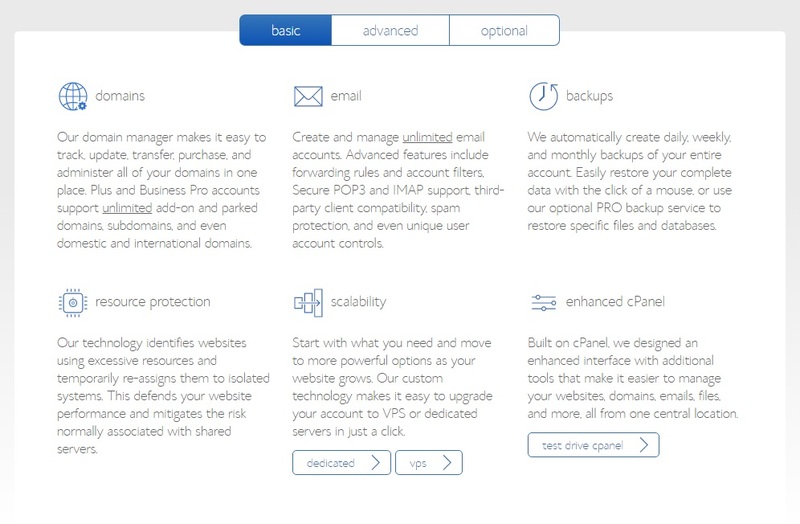 We highly recommend all Bluehost customers create and manage their own backups. Mike Lee: What are the security features that BlueHost offers? Savinaya: SiteLock. Real website security means protection from the inside out as well as the outside in. SiteLock is the one product that has the technology to do it all daily scanning, automatic malware removal, web app firewall, a global CDN for a blazingly fast website. Cost: > SiteLock Find: $2.50/month , $29.99 billed annually > SiteLock Fix: $7.99/month , $95.88 billed annually > SiteLock Prevent: $41.99/month , $503.90 billed annually. Mike Lee: How about Firewall? Savinaya: On the server level, there is Firewall security, if you want it to be in account level that is possible only in VPS /Dedicated account. Mike Lee: Is the server DDoS protected? What type of DDoS protection solution has been implemented? Savinaya: We have invested millions of dollars in providing as many redundant systems as possible, such as routers, Internet connectivity, ups power backups, and backup generators. However, the shared hosting environment does not allow for us to offer redundant or clustered servers while keeping our customers’ costs low. Mike Lee: Thanks for the information. What payment methods does BlueHost accept? Savinaya: Credit card and Paypal. Mike Lee: Any monthly payment option available? Savinaya: Only one VPS/Dedicated you can have a monthly payment. Mike Lee: Noted with thanks. Will consider and I appreciate your support. Bluehost offers many useful features such as easy to use control panel, SSL, SSH, and FTP. Besides, they also implemented Weebly as their website builder. Many people use Bluehost for hosting, but purchase domains elsewhere. If you’re new at building a site, you may be unfamiliar with changing the nameservers. It’s easy to do with Bluehost, especially if you purchased your domain with Bluehost. All you have to do is go to your cPanel, click on “Domain Management” and just follow the steps to create and propagate your custom nameservers. However, if you’ve purchased a domain through someone else, you can’t use custom nameservers. You have to use the Bluehost nameservers at the domain name site of your choice. If you’re not familiar with SSL (Secure Socket Layer) technology, most hosting sites have this for their e-commerce customers. At least that’s what it’s commonly used for. However, even if you’re not running an e-commerce site, but hosting a bulletin board with sign-in information, you can take advantage of Bluehost’s free shared Let’s Encrypt SSL certificate for those on a shared IP address. They also provide advanced paid SSL solutions for those who need greater website security. Positive SSL, Comodo SSL, and Wildcard SSL are some extra SSL protection feature offered by the Bluehost. For those who like to use SSH or Secure Shell access, Bluehost has this available. If you’re not familiar with this, it’s a network protocol that replaced “telnet” and other insecure ways of connecting to computers running Linux or Unix. Bluehost requires its users to use the SSH2 protocol as it’s the most secure. These days, SSH is most often used to connect to an SSH daemon running on a remote server, commonly to transfer files, remote admin and to have a more secure FTP (file transfer protocol). You can find SSH in your cPanel, but to access it, your hosting account has to be verified first. FTP access is usually a common feature of most hosting companies and Bluehost is no different. FTP, if you’re not familiar with it, simply means “File Transfer Protocol.” If you don’t have an FTP account, you can create one directly by going to your cPanel. If you need step by step instructions on how next to proceed, the knowledge base will help you out. If you’re not keen on WordPress, but want a quick way to build a website, you can check out the Weebly website builder on your cPanel. You can even upgrade to premium or e-commerce hosting on Bluehost and still use Weebly for those types of advanced functions, while still building a great-looking site quickly. Bluehost uses cPanel, which is an open-source control panel for helping customers navigate the process of creating and controlling their website with ease. Many hosting sites use cPanel, but not all, so Bluehost is a great company to look into if cPanel is what you’re familiar with. Here is the screenshot of Bluehost cPanel from my own account dashboard. 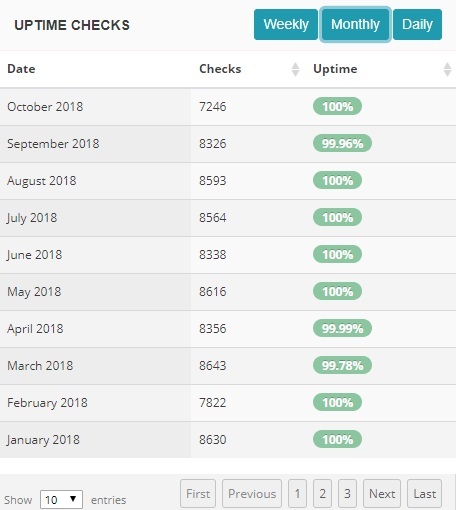 Bluehost is not just famous for great customer service and hosting features, but their uptime performance is also stable. They have a status system link under their support section so you can enter in one or more domains to look at any alerts that might affect you. All times on their site in USA Mountain Time, so a little time zone calculation will be needed if you’re anywhere outside that zone. If you see an alert that pertains to your domain and might want to check back time and again to see if the status has changed at all. I have a website hosted on Bluehost server and above is the uptime performance of that website. I cannot find any uptime guarantee made by Bluehost. Hence, I am using the industry standard of 99.90% as the target. As shown above, there are chances that the Bluehost did not achieve the target and sometimes Bluehost performed well under the month. Overall, I would say the Bluehost uptime performance is still quite good as most of the time the uptime average is at 99.90% and above. 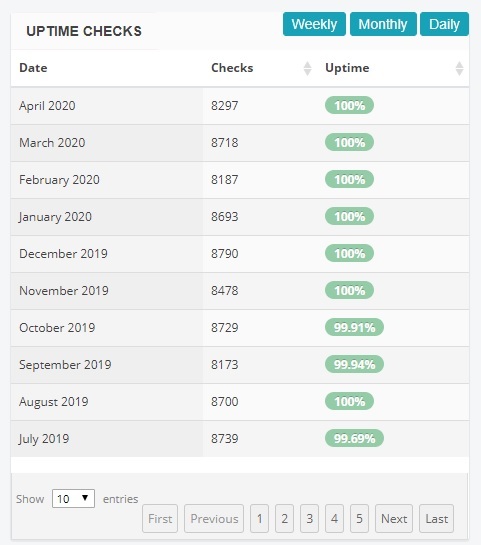 Note: I update this Bluehost uptime stats regularly, do bookmark this page if you are interested in checking their uptime performance again. Overall speed for Bluehost, like their uptime, is also generally excellent. The thing you have to remember is speed often has to do with your individual site as well as your hosting plan. If you have a dynamic site, as many do, you’re going to want a hosting plan that suits that kind of site. Besides, you may also find ways to optimize your site, perhaps by changing WordPress themes (if you use WordPress), using fewer or compressed image files (.png or .jpg) and so on. I conducted a test on Bluehost server by pinging one of my website hosted on Bluehost from 8 different locations. Bluehost server is quite good and scored A+ in Oct 2018. There are several tips where Bluehost can help you in improving the website response speed. They provide Cloudflare CDN and it improves the loading speed of your website in different locations. Obviously, Bluehost has a lot going for it, but not every web hosting service provider is perfect. Feature-rich, plenty of scripts and a wide variety of hosting plans, including an optimized plan specifically for WordPress fans. Excellent uptime with a status link in the support section for checking for any alerts that affect your domain(s). No free site migration service. Expect to pay $149.99 if you need them to help you out. Bluehost clearly has a lot more “plusses” than “minuses,” making it one of the best choices out there for those who need a variety of hosting options and scalability. With Bluehost, there is also a way to register a domain without going someplace else. From domain, basic shared hosting to advanced dedicated hosting solution, Bluehost is there for you. 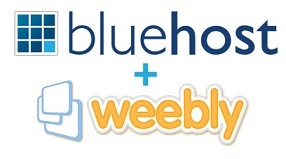 You can get most of the services needed for a website hosting with Bluehost. As a conclusion, Bluehost is an excellent web hosting company, and this is a company to keep on your “short list” of the hosting service provider. Compare BlueHost With Our Top Ranked Web Hosts!